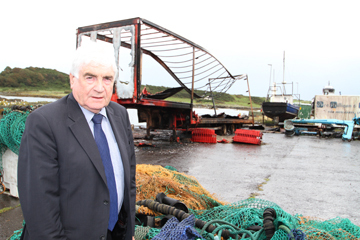 AS the business owners count the cost of fire damage to 1500 fishboxes and a lorry trailer, Downpatrick Police are appealing for information following the suspicious fire in the North Dock in Ardglass on Sunday 16 September. A PSNI spokesperson said: “Police received a report of the fire at approximately 7.55 pm. Police and the NIFRS attended the scene. A forty-foot trailer holding the boxes was completely destroyed and a refrigerated unit was also damaged as a result of the fire. Two small fishing boats on trailers in the vicinity of the fire sustained scorch damage and a street lighting pole was also severely burned. The cause of the fire is still under investigation, however, at this stage it is believed it was started deliberately. Councillor Dermot Curran has expressed his concern at the seriousness of the fire on Ardglass’ North Dock. “Anyone with any information about this incident is asked to contact police in Downpatrick on 0845 600 8000. Or if someone would prefer to provide information without giving their details, they can contact the independent charity Crimestoppers and speak to them anonymously on damage was caused to 0800 555 111. The fish boxes has just arrived from the manufacturers in Germany and had yet to be insured. It represents a very significant loss of £30,000 to the company, Ardgass Fish Sales. 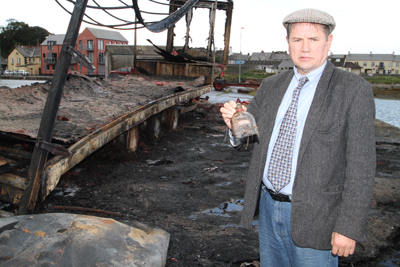 SDLP INdependent Down District Councillor Dermot Curran from Ardglass has expressed his complete dismay at the fire damage on the quayside at the North Dock. He said: “This is a very serious incident. The fire was very close to Milligan Oil depot and thankfully the fire services arrived to put this blaze out. “I understand that the police believe that this fire was malicious. If so, then the perpetrators need to be caught and put away. We do not need this sort of behaviour in our community. “If this continues there could be the loss of life and that is just not acceptable. This has to be sorted out properly. I have spoken to Simon Wills who owned the fish boxes and he explained that this will be a huge blow to his business. The fishing industry has to work very hard to make ends meet and does not need this sort of treatment. It simply must stop. On visiting the scene of the burned lorry trailer at the North Dock quayside, Independent Councillor Cadogan Enright looked over the scene of devastation and said: “I totally condemn this act of vandalism. It could have turned into a deadly fireball with loss of life. “The fire had potential to spread and only by the sheer hard work of the local firefighters who raced out from Downpatrick did we avert disaster on a large scale. Councillor Enright also said the environmental impact of such a large fire would cause considerable pollution around the harbour from the hundreds of melting fish boxes that dripped over the quayside. He also expressed dismay with the continuing anti-social behavior problem in Ardglass. 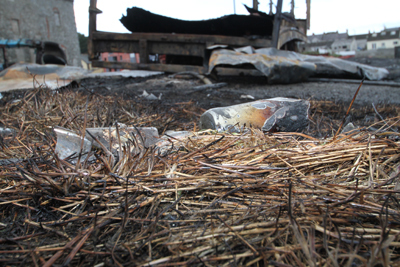 A number of drinks bottles were lying around in the vicinity of the fire at Ardglass harbour. SINN Féin Councillor Eamonn Mac Con Midhe has also added his dissaproval of the possible arson attack at Arglass harbour. He said: “Young people need to be aware of the dangers of lighting fires. They can simply get out of control and are a danger to life… including that of the fire service who had to put this serious blaze out. “If drugs and or drink were involved in this incident then action needs to be taken immediately to stop this ant-social behaviour. 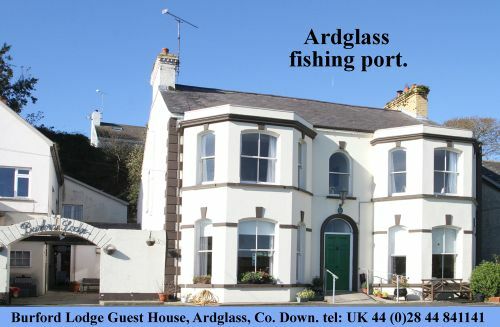 The residents in Ardglass certainly do not want this sort of behavior on their doorstep and the hard pressed fishing industry has enough to do without facing such huge setbacks.